CALGARY, AB – If this would have happened to a horse, the outcome would have been much different. On Wednesday morning, western Canada’s single largest concert grand piano was being picked up from Mount Royal University, and during the initial stages of the move, the massive piano broke two of its legs. Thank goodness they didn’t shoot it. The piano is a rare Italian piano called a Fazioli. Though they produce a very limited 100 grand pianos a year in many sizes, they also make the largest piano currently in production. Whereas a normal Steinway concert grand is less than 1,000 pounds and just under 9 feet long, the Fazioli F308 weighs nearly 1,500 pounds and is more than 10 feet long! The piano is being borrowed by our country’s most famous concert pianist, Angela Hewitt. She will perform on it with the CPO for audiences at the Jack Singer Hall today and tomorrow. New piano legs were immediately sent out from Vancouver which arrived to the Jack Singer Hall late Thursday night. 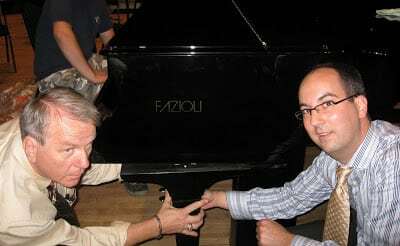 Manuel Bernaschek, owner of Vancouver based Showcase Pianos, installed the legs together with local concert technician Michael Lipnicki.